Some visitors say that Montréal reminds of them Europe and others say that it feels like a beautiful combination of both the old and new world. 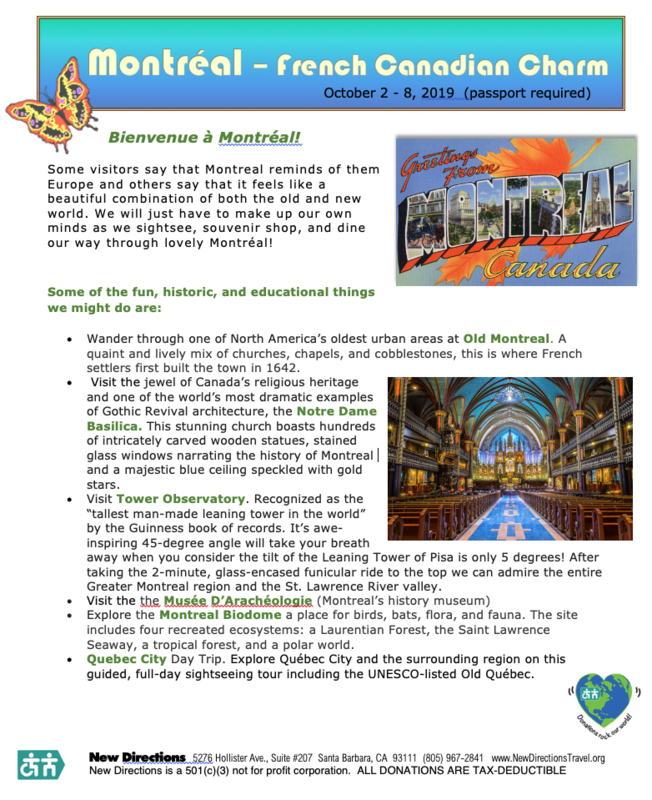 We will just have to make up our own minds as we sightsee, souvenir shop, and dine our way through lovely Montréal! Wander through one of North America’s oldest urban areas at Old Montreal. A quaint and lively mix of churches, chapels, and cobblestones, this is where French settlers first built the town in 1642. Visit the jewel of Canada’s religious heritage and one of the world’s most dramatic examples of Gothic Revival architecture, the Notre Dame Basilica.This stunning church boasts hundreds of intricately carved wooden statues, stained glass windows narrating the history of Montreal and a majestic blue ceiling speckled with gold stars. Visit Tower Observatory. Recognized as the “tallest man-made leaning tower in the world” by the Guinness book of records. It’s awe-inspiring 45-degree angle will take your breath away when you consider the tilt of the Leaning Tower of Pisa is only 5 degrees! After taking the 2-minute, glass-encased funicular ride to the top we can admire the entire Greater Montreal region and the St. Lawrence River valley. Explore the Montreal Biodome a place for birds, bats, flora, and fauna. The site includes four recreated ecosystems: a Laurentian Forest, the Saint Lawrence Seaway, a tropical forest, and a polar world. Quebec CityDay Trip. Explore Québec City and the surrounding region on this guided, full-day sightseeing tour including the UNESCO-listed Old Québec.